This is a A CALL TO ALL CONCERNED. You are aware that the three-day “Global Summit to End Sexual Violence in Conflict 2014” is presently on-going in London. On the concluding day of the summit, i.e. 12 June 2014, we from ICSF (International Crimes Strategy Forum) and Komola Collective have jointly arranged a citizens’ gathering at the venue of the summit for a peaceful and silent assembly to express our position on the Global Summit. Before knowing more about the time and place related information of this assembly, please read the following principles carefully and follow the mentioned requirements strictly. Encourage others to follow them as well. Our assembly is not a protest event per se. It’s ethos is purely and simply a silent gathering of citizens. Therefore, it is imperative that our assembly is conducted in a peaceful, silent, organized and constructive manner. There will be no slogans, no throwing about of hands and feet, and most importantly, no causing or initiation of any sort of disturbance at the Global Summit. The inherent strength of this assembly is the fact that it is the expression of silence in a peaceful and organized manner. This is important because we are offering our full support to this global summit. We support the summit because there is an on-going global effort to prevent the commission of sexual violence against women during conflicts. It is, therefore, our responsibility to ensure that our assembly does not cause any disorder or lead to any situations which may tarnish the honor of the Bangladesh State. We expect your presence beside us only if you agree with the nature of our assembly. On principle, we accord our moral support to the main goals of the global summit. We express solidarity with programs and discussions taking place over the three days of the summit. As a nation state we had to pay the highest price during our birth in 1971. 200,000 Bengali women and girls were subjected to sexual violence in the struggle for freedom and independence. Can there really be any other people who can truly relate to the meaning and importance of this summit? 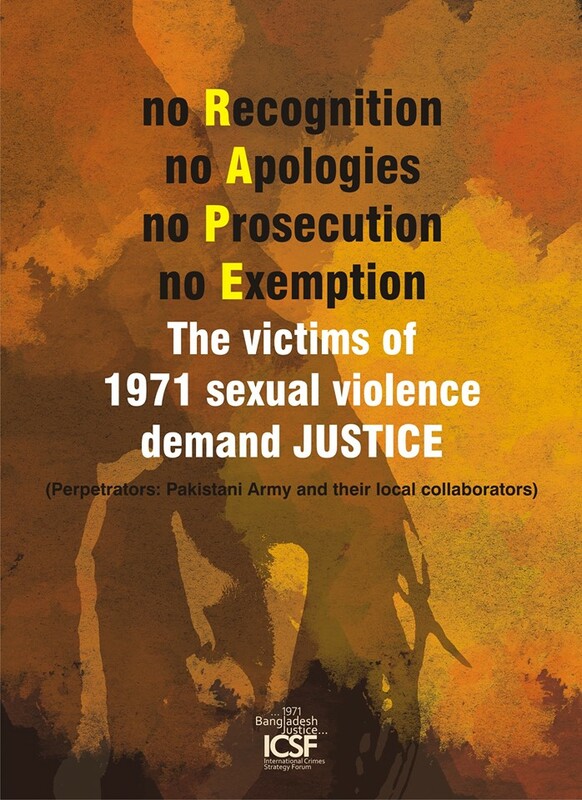 Our assembly is taking place to remember and extend our unconditional support as a nation to the 200,000 Birangona women and girls who were subjected to sexual violence at the hands of the Pakistan Army and their local collaborators, i.e. Razakars, Al Badr and Al Shams. We are assembling to pass on their stories of sacrifice to and demand justice before the whole world. What our Birangona women were subjected was the employing of sexual violence as a weapon of war. The lives the Birangonas have led for the past four decades is blatant example of the culture of impunity. Both these issues form the essence of the global summit in London. Nevertheless, no scope was kept to even mention the Bangladesh experience in the panel discussions and fringe events of the summit that are open to the public. We are assembling in protest of this. If you are in agreement with the three above-mentioned goals and statements, then we expect to find you in our assembly, irrespective of who you are or what country you represent. How to reach the venue? – Postcode: E16 1 DR or board the DLR taking you to Custom House or Prince Regent station. আমরা নীতিগতভাবে এই বৈশ্বিক সম্মেলনের মূল উদ্দেশ্যের সাথে সংহতি প্রকাশ করছি। সেখানে তিন দিন ব্যাপী যে অনুষ্ঠান এবং আলোচনা হচ্ছে হয়েছে, তার প্রতি আমাদের সম্পূর্ণ সমর্থন রয়েছে। জাতিরাষ্ট্র হিসেবে আমাদের জন্মলগ্ন ১৯৭১ এ আমাদের সর্বোচ্চ মূল্য দিতে হয়েছে। ২ লক্ষ বাঙালী নারী ও কন্যাশিশু যৌন সহিংসতার শিকার হয়েছেন আমাদের স্বাধীনতার মূল্য দিতে। সুতরাং, এই সম্মেলনের মর্ম এবং গুরুত্ব আমাদের চেয়ে কে বা বেশী অনুধাবন করে? কিভাবে পৌঁছাবেন? : পোস্টকোড: E16 1 DR কিংবা DLR এ Custom House অথবা Prince Regent স্টেশনের মাধ্যমে.